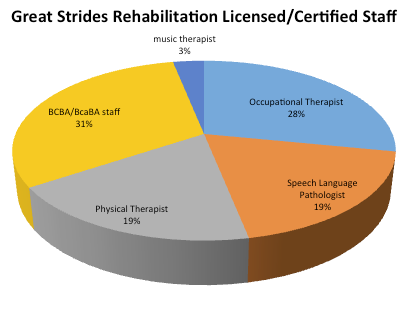 The clinicians at Great Strides Rehabilitation have worked hard to build a culture and atmosphere that places emphasis on valuing the employee, respecting a strong work-life balance, and supporting professional development in consistent and creative ways. All therapists can enjoy a challenging and growth centered atmosphere when working with Great Strides. Opportunities: As we continue to grow we routinely add qualified professionals to our team. We highly encourage you to submit your resume for consideration. If you have an interest in a career at Great Strides Rehabilitation, please email your resume and Letter of Interest to: Olivia Collings at admin@greatstridesrehab.com or FAX to 904-404-7743. If we do not currently have a position listed, we will keep your resume for future positions as they come available. A variety of community locations. If you have an interest in the ABA department, please email your resume and Letter of Interest to: Olivia Collings at admin@greatstridesrehab.com or FAX to 904-404-7743. If we do not currently have a position listed, we will keep your resume for future positions as they come available.